All brats beware! Now that summer will soon be upon us, the stores have stocked their shelves with all kinds of new nasty toys for evil minded tops to find. Prokadima game sets are plentiful and come in many varieties. Dan found a set like this one at a local department store among the beach toys. Not only is this thing big, it stings something awful. They say it’s a popular beach game but I have my doubts. I’ve never seen anyone out playing with anything like this before. I’d have noticed. The worst thing about these sets is that they come with two paddles per package. Two! I can’t even hide one and pretend he just misplaced it. The darn thing came with a backup paddle. The other item to be aware of is that scary thing marketed as a handheld bug zapper. It looks like a badminton racquet with metal wires but isn’t anywhere near as innocent. If you doubt me, take a look through these movies Dan linked to in this post. There are two that feature the zapper in them. We haven’t played with the zapper paddle for a while but I remember its “zing” very well. Ouchie! Owie. I wonder if it would hurt even more if they left the mesh stuff on it. Yikes! Looks like it has a good gripper handle too (Q always looks for this). Hope he doesn’t go shopping for this one. 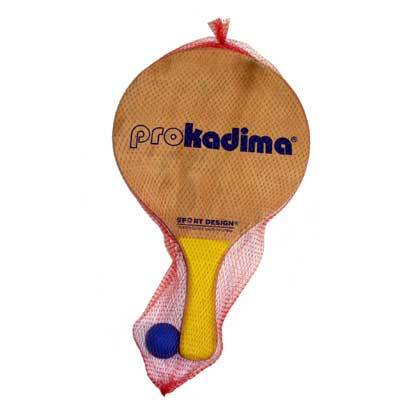 What Bethie doesn’t mention is that my “Prokadima” paddles (which don’t have that brand name, but are very similar to the ones shown) actually have lightning bolts printed on them. I’ll have to hunt down my digital camera and get a picture online. Right after I find where Bethie has hidden the batteries to the zapper…. Jayda, that zapper always freaks me out. I don’t know why but it does. Maybe it’s because I watched that movie Dan linked to – the one with the guy who whimpered so much. He just sounded so pathetic. I hope I don’t sound like that! I was about fourteen when I found these on top of the freezer in the garage. At that point my interest in spanking was fairly well-developed, especially for a kid who’d gotten ONE smack in my entire life, and I couldn’t even remember it, and as the years went by, I started pilfering them. There were four. I assume my parents bought them for our new pool (we had a pool put in when I was twelve). Nowadays at Publix, they sell these in rubber-faced format. Gotta buy a couple. I keep forgetting. In the very infrequent times that I switch, the woman who spanks me uses these a lot. I happen to enjoy them from either end. But they are not for the novice, and they are not for the spankee who can’t take a lot of punishment.